« Small Business Resources « « EMV vs. NFC Payments–What Is the Difference? EMV vs. NFC Payments–What Is the Difference? Learn about the new standard of secure payment systems and what it could mean for you. Every industry has its own lingo, and to play the game, you’ve gotta learn it. From EMV chip cards to NFC payments, we’ll be the first to admit that payments terminology can be a bit of a snore. However, as a small business, it’s pretty important to get educated. This is especially true given the EMV liability shift, which went down last October. After that date (now), you could be on the hook for certain types of fraudulent transactions if you haven’t updated your POS to accept more secure forms of payment. What is the difference between an EMV and NFC payment? EMV and NFC are two new, more secure ways to pay. Yet while they’re often looped together in discussion, they’re completely different things. Here is a breakdown between EMV and NFC payment, and why it makes sense to start accepting both at your business. Let’s take a deeper dive into EMV chip cards and NFC payments. Accept EMV chip cards and mobile payments* like Apple Pay™. EMV stands for “Europay, MasterCard® and Visa®” (we know; it’s not a particularly informative acronym). Here is what EMV means in practice: a transaction between a chip-enabled credit card (as opposed to a magnetic-stripe-only, or magstripe, card) and an EMV-enabled payment terminal or ATM. And, here is why you need to know about it: EMV will soon become the technological standard for credit card processing in the United States (it’s already the standard throughout most of the world). We’re switching over to EMV cards (i.e., chip cards) because they’re leagues more secure than the magstripe cards we currently carry. EMV cards contain a tiny, dynamic computer chip that talks back and forth with the payments terminal to make sure you’re not a fraudster. The technology works. In other countries that have adopted EMV as the standard, counterfeit fraud has dramatically declined. EMV cards are steadily making their way into mainstream rotation. 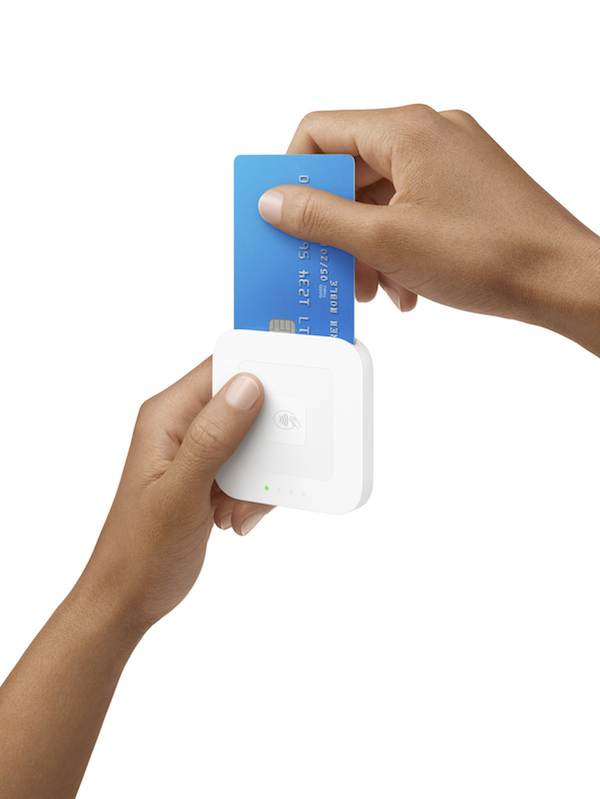 In fact, in December 2015, roughly 53 percent of cards processed on Square Stand were EMV chip cards, up from 12 percent last January. However, to process those cards as an EMV transaction, you need an EMV reader, which is something you’ll want to get soon. Why? For one thing, EMV transactions are more secure for both you and your customers. Also, the liability shift happened on Oct. 1, 2015, which means you could be on the hook for certain types of fraudulent transactions if you don’t have an EMV reader at this point. Read more about the EMV liability shift in our in-depth guide (linked above). NFC stands for “near-field communication.” Basically, it’s the technology that allows smartphones and other devices (like a payments reader) to communicate with each other when they’re close together. NFC enables contactless payments, which are transactions that require no physical contact between the payments device and the payments reader. At the moment, the buzziest example of NFC technology at work is Apple Pay. 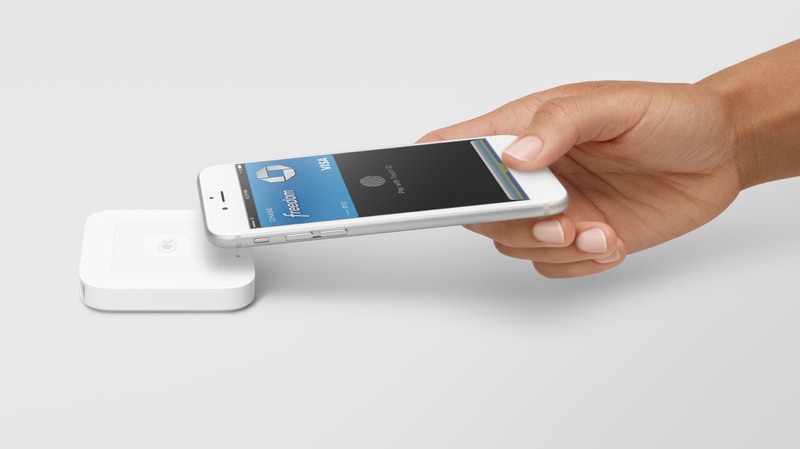 To trigger an Apple Pay payment, you hold your iPhone® 6 or Apple Watch® up to an NFC-enabled reader. The devices have to be pretty close–a couple inches at the most (that is where the “near” part of “near-field communication” comes in). The transaction time is really fast–the whole thing takes just seconds. It’s also really secure. Because Apple Pay works through Touch ID™ (Apple® fingerprint technology), things are pretty locked down even if your phone is stolen. In addition, contactless payments like Apple Pay contain multiple layers of dynamic encryption. The data associated with the cards you have on file is constantly changing. So even if fraudsters were somehow able to get in there, the information would be useless to them. What Is an NFC Reader? An NFC reader is equipped with the technology (something called Radio Frequency Identification or RFID) that allows it to communicate wirelessly with other devices or objects. An NFC reader could be a device that allows employees to sign in via an office badge or a payments reader that can process both NFC credit cards and mobile payments like Apple Pay, Google Pay™ and Samsung Pay®. EMV credit cards contain a tiny computer chip with more sophisticated security features than magstripe cards (they’re encrypted). They’re processed differently than magstripe cards–dipped instead of swiped. NFC cards are equipped with RFID technology that allows customers to “tap to pay.” They don’t need to be inserted into a payments reader; customers just hover or tap their card over the payments reader to initiate the transaction. The long and the short of it on EMV vs. NFC technology? Both are more secure ways to pay and process payments. The Square contactless and chip reader accepts both. You can order yours here. *Message and data rates may apply. Terms and Conditions are available. Apple®, Apple Watch®, and iPhone® are trademarks of Apple, Inc., registered in the U.S. and other countries. Apple Pay™ and Touch ID™ are trademarks of Apple, Inc. Google Pay™ is a trademark of Google LLC. Samsung Pay® is a registered trademark of Samsung Electronics Co., Ltd. Square, the Square logo, Square Reader and Square Register are all trademarks or registered trademarks of Square, Inc. in the United States and other countries.